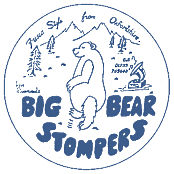 The Big Bear Stompers are the flag wavers of the West Coast Traditional Jazz sound exemplified by Lu Watters and Turk Murphy in the San Francisco area of the USA in the 1940s. 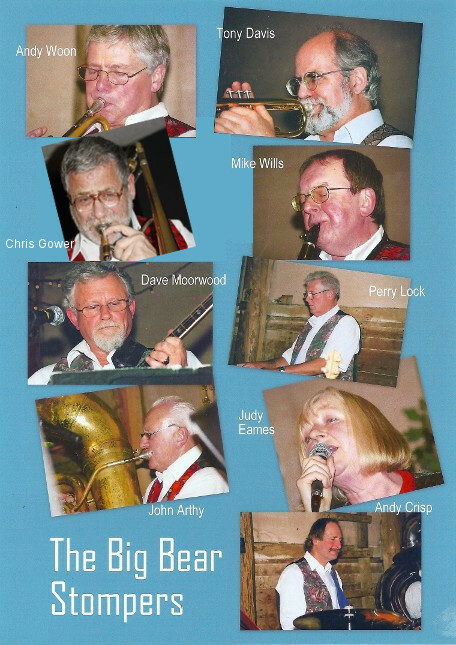 The band was founded by Dave Moorwood and trumpeter Clive Whitlock in 1989 and has been blowing up a storm ever since. The present line up features four front line musicians of great experience and skill. Andy Woon plays first trumpet, a strong lead and fine soloist whether with open horn or muted. The second trumpet chair is held by Tony Davis, notable for his hot Armstrong-inspired sound. Trombone is played by Chris Gower, a quiet man with a delightful sense of humour and a great trombone sound as well as a wonderful feel for the music. Mike Wills plays both clarinet and soprano sax, a peerless performer on both and a musician with wide experience. The Rhythm section is also four-strong and produces a surging beat. Pianist Perry Lock, an original Bear, is an ideal band pianist but also produces lovely blues-drenched solos. The sousaphone is handled by John Arthy — he produces a huge sound and is the foundation of the band. Andy Crisp, another original member is a drummer of great taste and uses his kit with variety and imagination. Bandleader and banjoist Dave Moorwood also sings occasionally, writes all the arrangements, is a rock solid player and occasionally produces sparkling solos. Judy Eames handles most of the vocals, a tuneful and tasteful singer with a repertoire from Blues to Vaudeville who has also been with the band since its inception. There are few indeed of the country’s top musicians who have not at some time guested with The Bears, including Humph, Acker Bilk and Kenny Ball. Visiting Americans have also joined the ranks from time to time including Turk Murphy stalwart Jim Maihack, pianist Jeff Barnhart and trombonist Jim Fryer. The Bears are always popular at festivals and jazz clubs with their classic jazz repertoire and exciting sound, right in the centre of the traditional jazz scene and yet with something unique to offer.